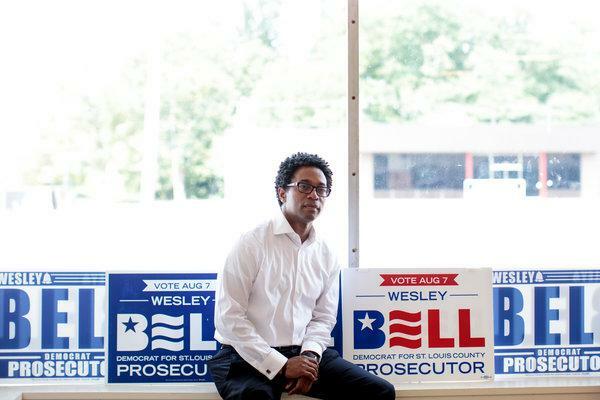 On Aug. 7, voters in St. Louis County, Mo., elected Wesley Bell, 43, a Ferguson city council member, to become the top prosecutor in the St. Louis County Democratic primary. Bell ran on a platform of reforming the prosecutor’s office. He ousted veteran prosecutor Robert McCulloch, 67, who has held the post for almost three decades and was widely criticized for refusing to charge the white Ferguson police officer who shot Micheal Brown, an unarmed teenager on Aug. 9, 2014. Two days before the four-year anniversary of Brown’s death, McCulloch lost in the St. Louis County Democratic primary to Bell, who is African American. Bell won with nearly 57 percent of the vote, a margin of more than 24,000, according to the board of elections. No Republicans were on the ballot, all but guaranteeing that Bell will be St. Louis County’s next prosecutor. Bell is a former municipal judge, prosecutor, and was elected to City Council in 2015. McCulloch has held the position since 1991 and ran unopposed in 2014. The recent primary was the first time McCulloch has faced voters since a grand jury declined to bring charges against police officer Darren Wilson, on manslaughter. According to The St Louis Post-Dispatch, several of McCulloch’s family members—including his father, (a St. Louis police officer, who was shot and killed by an African American suspect when McCulloch was 12 years old)– have worked for the St. Louis Police Department. McCulloch, as a teenager lost a leg to cancer and made it his career ambition to become a prosecutor. “I couldn’t become a policeman, so being county prosecutor is the next best thing,” McCulloch once told the Post-Dispatch. In the aftermath of the 2014 Brown shooting, critics said that McCulloch and his assistants presented evidence to the grand jury in ways that favored Wilson, the police officer, and cast doubt on Brown, the victim. The New York Times spoke with Bell before the election was held. (“McCulloch, who has long enjoyed the support of the state’s political establishment, did not respond to multiple requests for an interview”). In an edited and condensed version of the conversation that was published on Aug. 7, Bell said the community has changed in several ways since the events of 2014. “People are awake to the need to address issues like mass incarceration, to address issues like profiling and to address criminal justice reform in general,” Bell said. After his election loss, McCulloch, told reporters that he would probably retire, according to The St. Louis Post-Dispatch—adding that he had no regrets about how he handled the Ferguson investigation. According to The Huffington Post, 95 percent of elected prosecutors are white, and 79 percent are male. Only 1 percent of prosecutors are women of color. The majority of prosecutors—85 percent—run for election unopposed. They are rarely punished for misconduct, and a 1976 Supreme Court ruling gives them absolute immunity from civil suits.